– Chop the shallots very finely. – Cut the apple into small pieces. – Open the oysters and conserve their liquid. – Melt the butter in a pan and sweat the shallots for 2 minutes on a low heat. – Add the cider and liquid from the oysters. Reduce by three quarters and add the double cream. – Continue to reduce for a few minutes, then add the crème fraîche and allow to thicken. – Heat the grill of the oven to quite a high temperature. – Place the oysters in a dish with some coarse sea salt in the bottom to keep the oysters upright. 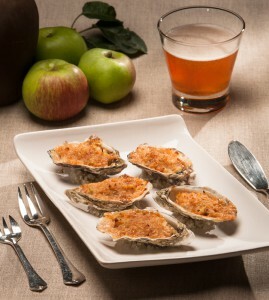 – Cover the oysters with pieces of apple, a spoonful of sauce and sprinkle with breadcrumbs. – Brown under the grill. – Cook the short grain rice with a stock cube and season with coarse sea salt. – Chop the1/2 cucumber into thin strips and mix with the grated carrot. – Shuck the oysters and cook for 30 seconds in their liquid. 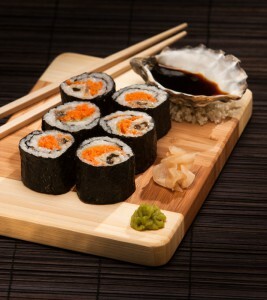 – Unroll the sheet of Nori and cover it with rice, some cucumber and carrot. – Add the oysters and roll the sheet. – Chill for 2 hours before cutting into pieces. – Serve with Nuoc Mam sauce. id, elit. ut libero amet, vulputate, ut mattis consequat.